Ever since the FDA started cracking down on DMAA (known as dimethylamylamine or 1,3-DMAA, a very strong stimulant), those in the industry have searched for something legal and safer than DMAA, yet still powerful enough to be worth using. This has led to the popularity of a new supplement called Eria jarensis extract. This herb is very potent, because it contains phyto-chemicals that have a profound stimulatory effect on your system. 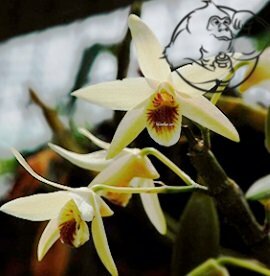 Since Eria jarensis extract (N-Phenethyl Dimethylamine) comes from the Eria orchid species, found mostly in Asia, it’s naturally occurring and legal for sale as a nutritional supplement. It should be no surprise to anyone that the plant kingdom has given us yet another strong stimulant, because plants are already responsible for Caffeine, Ephedrine and Coca. This new Eria jarensis extract will take its place as the new stimulant of choice for Bodybuilders seeking an alternative to the now-illegal DMAA (dimethylamylamine or 1,3-DMAA). Eria jarensis extract (N-Phenethyl Dimethylamine) offers therapeutic, mood-boosting effects by increasing dopamine and noradrenaline in the body. We all know that dopamine is the 'feel good' hormone, which offers the sensation you get when biting into an oily slice of pizza or winning a big pot when playing poker. In short, this extract increases the feel-good hormone in your system. These hormones also boost concentrations levels, alertness, and focus, thus giving you a euphoric sensation. This euphoric high is part of the reason why DMAA became so popular. And Bodybuilders are now turning to Eria jarensis extract to fill the gap left by DMAA prohibition. Recent studies have shown that ingesting Eria jarensis extract produces high levels of phenethylamine in the body. Phenethylamine is a potent stimulant and psychoactive that works to modulate dopamine and noradrenaline release. This is a great finding and explains why it’s such a potent supplement, along with why users of this extract report having the same effects as they did with the now-banned DMAA. 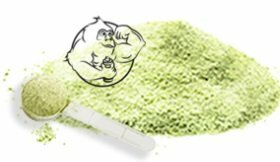 Eria jarensis extract (N-Phenethyl Dimethylamine) can have a piggyback effect when it comes to bodybuilding and weight training. For one, it will help improve your mood and focus in the weight room, thus boosting your workouts. It also works as a fat burner and appetite suppressant. You’ll get full faster when you take Eria jarensis extract and eat a meal. Being able to control your caloric intake this way will greatly improve your ability to burn fat and lose those extra pounds around the midsection. Eria jarensis extract just makes it a lot easier to stick to your diet, no matter how strict it may be. To top it off, Eria jarensis has also been shown to help as a bronchodilator, which makes it easier to do cardio and eke out extra reps as your heart rate rises during a set. This is another common effect of stimulants like Clenbuterol or Albuterol, which are prescribed for this purpose and are also used to burn fat by bodybuilders. Although most stimulants used for fat loss can cause some jitteriness and anxiety, Eria jarensis extract is different in that it has been reported to reduce anxiety. This is a very special feature that’s exclusive to this stimulant. Eria jarensis extract (N-Phenethyl Dimethylamine) should not carry excessive side effects if used at a proper dosage. Those who choose to ignore commonsense and dose it too high can experience discomfort from taking “too much stimulant,” and can experience a faster heart that can take several hours to feel calm again. 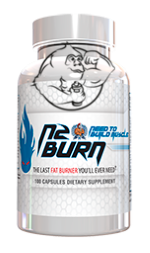 Instead of trying to find a dosage yourself, you should use a formula designed by an expert like N2Burn, which has just the right serving of Eria jarensis extract that’ll help you burn fat and never feel jittery on it. Not only will you get the proper dosage, but also a formula with other strong fat burners for a synergistic effect. Eria jarensis extract (N-Phenethyl Dimethylamine) is legal to purchase, however, I highly recommend that you avoid running it solo. For best results, run it in a stack with other fat burners. The best way to use it is as part of a comprehensive supplement stack like the N2Burn we mentioned above. 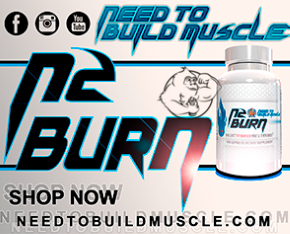 N2burn contains 150mgs per serving of Eria Jarensis, plus 9 additional ingredients. It can be purchased at n2bm.com. The best way to take N2Burn for fat loss is by using 1 or maybe 2 capsules in the morning (you must assess your own tolerance), then taking 1 to 2 more in the early afternoon – not too close to bedtime or it can keep you up. Some guys who are looking for a very strong stimulant effect will take as many as 3 to 4 capsules in one serving. But this is a high dosage, reserved only for experienced users of DMAA, who are looking to N2Burn as a fat-burning alternative to their now-banned DMAA products. With N2Burn, you will begin to see results within the first week of using the product. And its appetite-suppression capabilities begin to shape your midsection very quickly. For guys using Clenbuterol and Albuterol, we all know either of these drugs stop working after only two weeks. For asthma patients, these are fine long-term. But regarding the fat-loss properties of these two drugs, after two weeks, your receptors won’t respond the same way to the clenbuterol or albuterol, so you must clear out for two weeks before jumping on it again. N2Burn is the absolute perfect product to use during your two weeks “off” the Clen or Albuterol. You can run a great cutting cycle using Clen for two weeks, then coming off it and switching to N2Burn for two weeks, then coming off that to jump back on the Clenbuterol for two more weeks. This type of protocol keeps you burning fat while reaping maximum benefits from your Clenbuterol or Albuterol use.